This web site is for those actively or interested in teaching with our textbook, Beginning Biblical Hebrew: A Grammar and Illustrated Reader (Baker Academic 2013). On this site we host a blog, in which we will address questions submitted by instructors or interested instructors, a forum, in which we can interact dynamically with instructors using the textbook, a resource page, where we will post “beta” (in-progress, draft) supplementary materials to use with BBH (and we welcome suggestions! ), and links to the eSources that Baker has provided on their BBH textbook site. This innovative textbook by two leading experts in Biblical Hebrew combines the best of traditional grammars, new insights into Hebrew linguistics, and a creative pedagogical approach. The material has been field tested and refined for more than a decade by the authors, who are actively engaged in teaching Biblical Hebrew and in scholarly discussions and research. 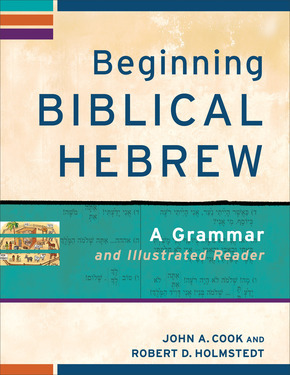 Beginning Biblical Hebrew includes fifty brief grammar lessons with accompanying workbook-style exercises, appendixes providing more detailed explanations, and a full-color reader–bound at the back of the book for right-to-left reading–that incorporates comics, line drawings, and numerous exercises, all in Hebrew. The work offers a realistic approach to beginning Hebrew, helping students comprehend texts without overloading them with too much information. Professors in seminary and university settings can adapt the book to either one-semester or full-year courses. An accompanying website offers helpful resources for students and professors. Resources for students include flash cards and audio files. Resources for professors include sample quizzes, sample exams, sample lesson plans, and a full-color printed instructor’s manual. John A. Cook (PhD, University of Wisconsin-Madison) is associate professor of Old Testament at Asbury Theological Seminary in Wilmore, Kentucky. He has taught undergraduate and graduate courses at the University of Wisconsin (Madison and Milwaukee campuses), Trinity Evangelical Divinity School, Wheaton College, and Grace College. Robert D. Holmstedt (PhD, University of Wisconsin-Madison) is associate professor of Near and Middle Eastern civilizations at the University of Toronto in Toronto, Ontario. His primary research interest is the linguistic study of Northwest Semitic languages.